Nassau, The Bahamas – Thirty-three public school teachers have been nominated for the Ministry of Education, Science and Technology’s 2012-2014 National Teacher of the Year Award. Education Director Lionel Sands officially launched the 2012-2014 programme that recognises outstanding educators within the public school system at a press conference on July 4. Mr. Sands said the nominees have distinguished themselves as “excellent” teachers through their work and ideas. 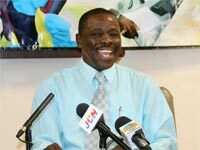 “They each have a fair chance of winning this award and being an ambassador for education in the Commonwealth of The Bahamas,” he said. Now in its tenth year, the awards programme is being held under the theme “Celebrating Outstanding Educators…Rewarding Excellence”. The celebration of events begins on Tuesday, October 9 and ends on Saturday, October 13. “We truly want to focus on teaching standards and uplifting this noble profession. We want this to be a genuine national celebrations and will be encouraging the general public to become involved in the various activities,” he said. He noted that it is only through committed, concerned and qualified teachers, that the educational system can cultivate the abilities, skills and talents of students. “Educators will be a part of the transformation we hope to achieve in education during the next five years and beyond,” said the director. The Teacher of the Year Awards was introduced by the Bahamas Union of Teachers (BUT) during the 1987 -1988 academic year to recognise and pay tribute to excellent teachers in the public school system throughout The Bahamas. Ten years later, the Ministry of Education, supported by the BUT became the lead sponsor and the result was the National Teacher of the Year Award exercise. The programme has evolved into a biennial event that is organised in school districts and includes primary, secondary, all-age and special schools. Ms. Afrika Karamo-Miller, a Modern Languages Teacher at Sister Mary Patricia Russell Junior High School in Grand Bahama is the current National Teacher of the Year. She will be a part of The Bahamas’ delegation attending the Commonwealth Ministers of Education Conference in Mauritius in August. Church Service at Christ Community Church, 7 p.m.
A Courtesy Call on the Governor General His Excellency Sir Arthur Foulkes. Jerome Fitzgerald, Minister of Education, Science and Technology in attendance, 10 a.m. Cultural Show climaxing with Junkanoo Rush, 7 p.m.
Gala Black-Tie Awards ceremony, 7:30 p.m.